Stafford Magician David Oakley is a member of several Magical Societies and Equity. 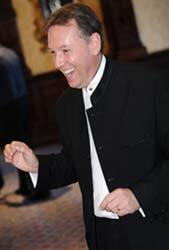 He is based in the midlands but entertains all over the UK at many of the top venues throughout the country. David has also had years of experience performing his magic at awards dinners & product launches. He brings the magic right into the hands of the spectator, amazement that is long remembered and talked about. David can perform close up magic at the table, between courses of a meal or in a mix and mingle situation which is suitable for cocktail parties, drinks receptions and product launches. Whatever occasion you are celebrating, a birthday, wedding, anniversary or maybe a Christmas party or summer barbeque David is the perfect solution to your entertainment needs. He will amaze and amuse, but most of all he will entertain. With charming style and intangible humour, David provides a unique and exquisite entertainment experience for both social and corporate occasions. His modern and skilful approach to the art of close up magic has made him one of the most sought after close up magicians in the UK. He is often the entertainer of choice by many of the world’s largest blue chip corporations, celebrities and politicians who are seeking to wow their clients, colleagues or friends with an experience they will never forget. "CONGRATULATIONS!! You have taken my family and friends by storm! Saturday 18th was an absolute triumph and about 70 people were in love with you! I cannot express adequately how wonderful your act is, and how impressed I, and my guests, were with your entire presentation. I cannot visualise there is anyone who could better provide a higher quality entertainment for any important occasion." Please see David's website for more information. Children's Entertainer and Magician for all occasions. Professional, Reliable, Fully Insured, Member of Equity and CRB Checked. Add a Touch of Magic to your event with Great Comedy Magic Show's, Balloon Animals, Face Painting, Puppets, Disco, Close up Magic and more. I have been Practising Magic for over two Decades. All my Magic is close up, no sleeves to hide anything. I am still a serving Soldier in the British army and am always seen entertaining the troops. I have entertained at Officers/Snco's Functions in front of some of the most important people in the armed forces. And I always went down with a bang, Excuse the Pun. As well as entertaining my troops I am available for weddings, stag/hen parties, Office Parties and any event. Named by "The Stage" Trade journal as one of the TOP FOUR Close Up Magicians in the UK! Member of the Inner Magic Circle (Gold Star). Professional and reliable with over 20 years experience. For more information on Dave's performance call him now on: 01905 771674 or email him at info@davejonesmagic.com. Please click here to submit your profile!